That's not a sword, this is a svord! Yeah, not a typo, it's a svord. A folding knife based on a mid 1600's eastern European (Bohemian and Bavarian) design. 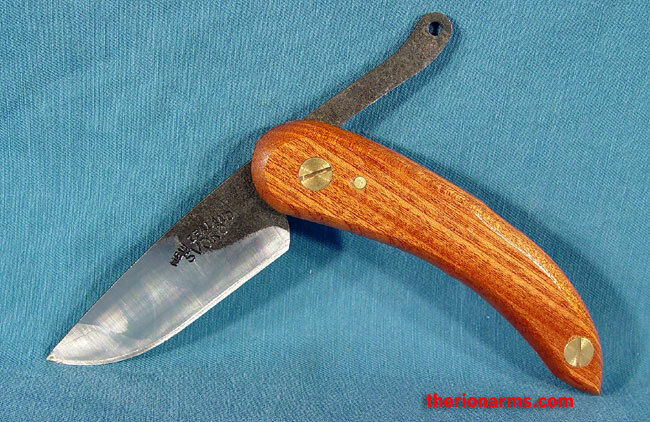 The general style goes back to Roman times, and was commonly used for working class knives until fairly recent times. The blade is held in place by friction and the user's hand on the blade tang. The direction of force when cutting tends to hold the blade open, and the handle slabs flex a bit to provide friction to hold the blade securely in both the open and closed positions. The hardened and tempered high carbon steel blade is about .084" thick and has a convex grind with a secondary bevel. Except for the bevel, the blade still has the black scale for a rustic look. The blade is zone-hardened so the edge is hard and the back is tough. Despite the full size it only weighs a little over 2 ounces. They are hand crafted in New Zealand. Yup, that's multiculturalism for you - an historical Bohemian knife made in New Zealand sent to you from a guy in Texas. Put one in your pocket pouch today!